For Chicks Who Crave NON-STOP Adventure! Who says you need to wait to until you've finished all the laundry, paid the bills, dishes are put away and work is done? Your soul and spirit say cast off and set caution to the wind. Don't put off celebrating life one more day..... because PLAY TIME is NOW! The truth is if you leave your someday s to happen-stance, they will never happen. If you want to do something in life you've got to set your priorities, make a plan, and make it happen. Come take a leap of faith and set aside mundane tasks for an epic adventure. We will swing from vines, run, jump, climb, play in the mud, get feet wet, face fear, but most of all we will feel our hearts beat and know we are totally ALIVE! Take in the beauty of the Smoky Mountains in Gatlinburg, Tennessee. Get away from computers, cell-phones and leave stress behind at this amazing mountain retreat setting! Enjoy 3 days and 2 nights of a bikini friendly menu, vigorous exercise and excursions, and most of all a fun weekend away with the girls. The ChickFit Boot Camp experience will leave your mind, body, and spirit totally rejuvenated! April 22-24-2016 Our ADVENTURE will take place in… The SMOKIES at an Exclusive Mountain Resort! "Thank You Linda Mitchell for ripping me head first out of my bubble of a "comfort zone" and allowing me the experience to learn I'm capable of things I never thought I could do!! I feel a bit more empowered to take on life in a new way!! Seriously I can hardly believe I did this! It was amazing, exhausting, very difficult, and with the support of these fantastic women and our fabulous guide I loved and hated it all at the same time - LOL! Its going to continue to require the support of you & these amazing ladies! I hope you're all up to dragging me along with you!! LOL"
"Thank you sooooo much for an amazing ChickFit Weekend! 10 days later and I still feel great! What a wonderful opportunity to get out of our normal little boxes and experience the adventure life has to offer (with awesome new friends!) I loved every minute, even the ones when I was gasping for air. My lungs thank you, my muscles thank you, and my heart thanks you! Love you!!!!" "Thank you so much for everything Linda! So many adventurous first times to share with some awesome chicks." "The trip was AMAZING and so glad to have had the opportunity!! Thanks for organizing and can't wait for next year!!" 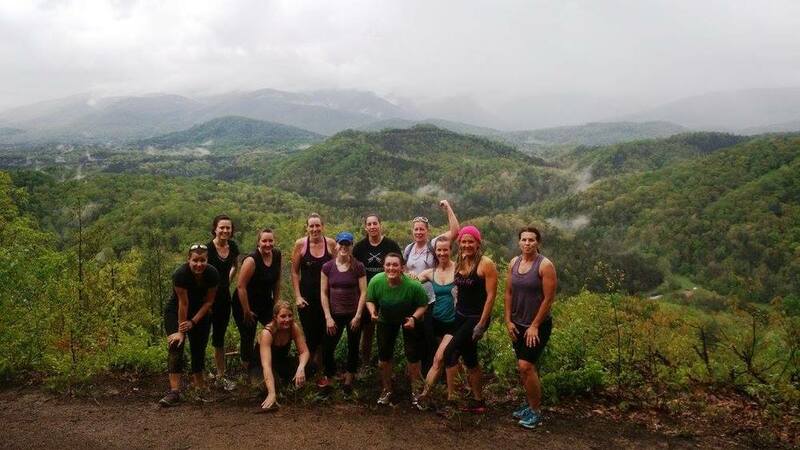 "The ChickFit weekend was an incredible experience. It has given me a positive outlook on exercise and uncovered the strong woman." This year, we will all be staying at a huge chalet at a luxurious spa resort that sleeps 32 people, most of us will be sharing a room. Please notify me in advance if you wish to book some Spa time as appointments will go quickly at chickfitpeeps@gmail.com Our lodging will offer the finest amenities from granite counter-tops, fully furnished living rooms, and kitchens, fireplaces, kitchens, furnished decks, gas grills, Jacuzzi's, hot tubs, and pool tables, hi-speed internet access, flat screen TV's, DVD players, and a washer/dryer. Also, during our stay at The Resort be sure to experience all of the great amenities offered: swim in the heated outdoor pool (seasonal), relax in the family-size hot tub, enjoy the heated indoor pool, the game room, or fitness room located in the resort; all walking distance from your cabin. Space is limited! This event will sell out. * Navy Seal (private edition) Extreme Obstacle Course Challenge. Obstacles are there for those who want the challenge or can be by-passed if needed. Need a helping hand, receive help from a team-mate. We are doing this in the spirit of adventure and fun. You will still get a workout minus the obstacles as there will be plenty of hiking involved. It may look difficult but no worries. Obstacles can be bypassed if needed or receive help from a teammate. We are doing this in the spirit of adventure and fun. This will be a two-part beauty boot camp. The first part will be; Indulging yourself in an array of organic euphoria for your face, hands and feet. I will provide you with homemade organic beauty recipes from my latest book "The Sisterhood of Sweat" that you can easily make in the comfort of your own home. You will also get to try samples of S.W. Basics of Brooklyn, Sprout Skincare, and the all natural BeauCle Skincare Line of top nutritionist and best-selling author Ann Louise Gittleman. Learn how to be an organic goddess with these easy-to-make home remedies. We will start with a brief warm up of sun salutations and calisthenics then you will be lead through a multitude of ChickFit Boot Camp drills with a Cross-fit Influence. The main focus of this transforming workout will be placed on women’s problem areas. - An casually adventurous tour of some less traveled areas of beautiful Douglas Lake! - An easy tempo and pace intended for the enjoyment of scenery and the fun of friendship! How's this for a real adventure! I'm totally pumped and super excited to announce we are adding Climb Works Mountain Biking to our once in a lifetime thrill seeking weekend with the girls. The goal at Climb Works is to push you a little out of your comfort zone at your own pace. If you feel comfortable riding a bike, have decent coordination, and are ready to sweat then you have what it takes. If you're a first timer, our bike experts will be there to give you pointers and help you to have an incredible first experience. If you're an experienced rider, our world-class designed flow trail – packed with rollers, berms, logs, bridges, and incredible wood features – will give you all the excitement you'll want as you experience the Smokies from a whole new point of view. Rafting on the upper section of the Pigeon river is an exciting 2 hour whitewater rafting trip with continuous class III-IV rapids. This fully guided trip is perfect for groups with beginners or intermediate paddlers. Expect to be soaking wet and excited in the big rapids while our experienced guides share with you an unforgettable memory. There are chances to cool off in the summer sun and float beside the boat in the calm stretches of the river. Minimum age is 8 years old or 70 lbs. Suitable for beginners and non-swimmers. See what a trip down the Upper Pigeon is like! "The perfect shoes can change your life." Do you avoid all mirrors because you aren’t happy with who you see? Do you have trouble knowing what colors and styles look best on you? Do you leave the store with nothing in hand after hours of shopping or spend money on clothes you never wear? Led by the fabulous instructor Marie Stitzel. Dance, Dance, Dance! - All in a fun-filled environment with your girlfriends. Burn up the dance floor and burn calories too! Hip Hop blended with salsa, reggae, cha cha, and all sorts of dance moves. Marie makes them simple and easy to follow! Anyone can do this! This workout feels more like a night on the town than exercise. Drop the pounds and get rapid results while you dance, dance, dance. Marie will make you have that dance fever once again. This will be a breath-taking experience so be sure and bring your yoga mats. This is an experience you won’t want to miss. Full deposit required! We have a no refund policy. Once a registration is submitted, it will be processed and can not be refunded for any reason; however a Letter of Credit or Transfer is available for up to 1 year. A Letter of Credit is available for a $75 administrative processing fee. All requests for Letters of Credit must be submitted in writing and include the reason for cancellation. Requests must be submitted one week prior to any ChickFit Boot Camp excursion. ChickFit is not responsible for acts of god or nature, terrorist attacks, war, union or labor disputes, or other events out of our control.